The Map type is used to display a map or image of the Earth, with the capability to also display interactive objects tied to the map's surface. There are a variety of different ways to visualize the Earth's surface in a 2-dimensional manner, but all of them involve some kind of projection: a mathematical relationship between the 3D coordinates (latitude, longitude and altitude) and 2D coordinates (X and Y in pixels) on the screen. Different sources of map data can use different projections, and from the point of view of the Map type, we treat these as one replaceable unit: the Map plugin. A Map plugin consists of a data source, as well as all other details needed to display its data on-screen. The current Map plugin in use is contained in the plugin property of the Map item. In order to display any image in a Map item, you will need to set this property. See the Plugin type for a description of how to retrieve an appropriate plugin for use. The geographic region displayed in the Map item is referred to as its viewport, and this is defined by the properties center, and zoomLevel. The center property contains a coordinate specifying the center of the viewport, while zoomLevel controls the scale of the map. See each of these properties for further details about their values. When the map is displayed, each possible geographic coordinate that is visible will map to some pixel X and Y coordinate on the screen. To perform conversions between these two, Map provides the toCoordinate and fromCoordinate functions, which are of general utility. Map related objects can be declared within the body of a Map object in Qt Quick and will automatically appear on the Map. To add objects programmatically, first be sure they are created with the Map as their parent (for example in an argument to Component::createObject), and then call the addMapItem method on the Map. A corresponding removeMapItem method also exists to do the opposite and remove an object from the Map. Moving Map objects around, resizing them or changing their shape normally does not involve any special interaction with Map itself -- changing these details about a map object will automatically update the display. The Map type includes support for pinch and flick gestures to control zooming and panning. These are enabled by default, and available at any time by using the gesture object. The actual GestureArea is constructed specially at startup and cannot be replaced or destroyed. Its properties can be altered, however, to control its behavior. Maps are rendered using OpenGL (ES) and the Qt Scene Graph stack, and as a result perform quite well where GL accelerated hardware is available. For "online" Map plugins, network bandwidth and latency can be major contributors to the user's perception of performance. Extensive caching is performed to mitigate this, but such mitigation is not always perfect. For "offline" plugins, the time spent retrieving the stored geographic data and rendering the basic map features can often play a dominant role. Some offline plugins may use hardware acceleration themselves to (partially) avert this. In general, large and complex Map items such as polygons and polylines with large numbers of vertices can have an adverse effect on UI performance. Further, more detailed notes on this are in the documentation for each map item type. The following snippet shows a simple Map and the necessary Plugin type to use it. 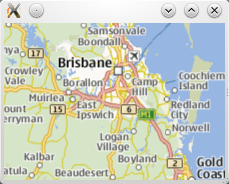 The map is centered near Brisbane, Australia, zoomed out to the minimum zoom level, with gesture interaction enabled. Access to the currently active map type. This property can be set to change the active map type. See the supportedMapTypes property for possible values. This property holds the coordinate which occupies the center of the mapping viewport. Invalid center coordinates are ignored. The default value is an arbitrary valid coordinate. This read-only property holds the last occurred mapping service provider error. Map.NoError - No error has occurred. Map.NotSupportedError -The plugin does not support mapping functionality. Map.UnknownParameterError -The plugin did not recognize one of the parameters it was given. Map.MissingRequiredParameterError - The plugin did not find one of the parameters it was expecting. Map.ConnectionError - The plugin could not connect to its backend service or database. This read-only property holds the textual presentation of the latest mapping provider error. If no error has occurred, an empty string is returned. Contains the MapGestureArea created with the Map. This covers pan, flick and pinch gestures. Use gesture.enabled: true to enable basic gestures, or see MapGestureArea for further details. Returns the list of all map items in no particular order. These items include items that were declared statically as part of the type declaration, as well as dynamical items (addMapItem, MapItemView). See also addMapItem, removeMapItem, and clearMapItems. This property holds the maximum valid zoom level for the map. The maximum zoom level is defined by the plugin used. If a plugin supporting mapping is not set, -1.0 is returned. This property holds the minimum valid zoom level for the map. The minimum zoom level is defined by the plugin used. If a plugin supporting mapping is not set, -1.0 is returned. This property holds the plugin which provides the mapping functionality. This is a write-once property. Once the map has a plugin associated with it, any attempted modifications of the plugin will be ignored. This read-only property holds the set of map types supported by this map. This property holds the region which occupies the viewport of the map. The camera is positioned in the center of the shape, and at the largest integral zoom level possible which allows the whole shape to be visible on the screen. This implies that reading this property back shortly after having been set the returned area is equal or larger than the set area. Setting this property implicitly changes the center and zoomLevel of the map. Any previously set value to those properties will be overridden. This property does not provide any change notifications. This property holds the zoom level for the map. Larger values for the zoom level provide more detail. Zoom levels are always non-negative. The default value is 8.0. This signal is emitted when the user clicks on a link in the copyright notice. The application should open the link in a browser or display its contents to the user. Adds the given item to the Map (for example MapQuickItem, MapCircle). If the object already is on the Map, it will not be added again. Note: MapItemViews cannot be added with this method. See also mapItems, removeMapItem, and clearMapItems. See also mapItems, addMapItem, and removeMapItem. Returns the position relative to the map item which corresponds to the coordinate. Returns an invalid QPointF if coordinate is not within the current viewport. Starts panning the map by dx pixels along the x-axis and by dy pixels along the y-axis. Positive values for dx move the map right, negative values left. Positive values for dy move the map down, negative values up. During panning the center, and zoomLevel may change. Removes the given item from the Map (for example MapQuickItem, MapCircle). If the MapItem does not exist or was not previously added to the map, the method does nothing. See also mapItems, addMapItem, and clearMapItems. Returns the coordinate which corresponds to the position relative to the map item. Returns an invalid coordinate if position is not within the current viewport.